Long-Term Psychodynamic Psychotherapy: A Basic Text takes a hands-on approach, focusing on the fundamental principles and basic features of the psychodynamic modality for the benefit of training directors and trainees in a variety of mental health fields. 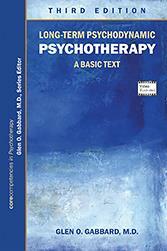 This new, meticulously updated edition offers the latest research on the foundations, techniques, and efficacy of psychodynamic psychotherapy, while still providing the basic information on assessment, indications, formulations, therapist interventions, goals of therapy, and mechanisms of therapeutic action that all mental health professionals require in order to provide excellent care. The author, one of the foremost authorities on psychotherapy, recognizes the common dilemmas experienced by beginning therapists and students, and he has designed the book so that the case examples—and principles illustrated by those examples—are directly applicable to learning and practice. Noteworthy and unique to this volume are the expanded videos, which allows students to see clinical concepts in action through the use of carefully constructed clinical vignettes. Each chapter has been thoroughly revised, and the new edition boasts a substantial amount of new material and enhanced coverage. • Literature on the empirical evidence supporting the efficacy of psychodynamic therapy, increasingly the focus of rigorous clinical trials, has been added to Chapter 2. • The videos, originally provided as a companion DVD and now available online, have been expanded with two new case study vignettes and now include two vignettes of the same patient during and at the termination of therapy. This satisfies the need of trainees in psychotherapy to study senior clinicians at work and to see how the concepts and data in the field are applied to individual treatments. • The recent ubiquity of texting, e-mailing, social media, and other cyberspace communications in the practice of psychotherapy is covered in Chapter 3. • Practical, hands-on applications, such as case write-ups, oral presentations at case conferences, written examinations, oral examinations, videotaped recordings and direct observations, audiotape recordings, and supervision are covered in depth to help build solid skills and broad knowledge. As useful to educators as it is to students, Long-Term Psychodynamic Psychotherapy explains the theoretical foundations and elucidates the reasoning behind the psychotherapist’s actions in a wide variety of clinical situations, challenging the reader to build empathy and competency. of Psychiatry at Weill Cornell Medical College, and Training and Supervising Analyst at Columbia University Center for Psychoanalytic Training and Research, New York, New York. Chapter 4. Therapeutic Interventions: What Does the Therapist Say and Do? Glen O. Gabbard, M.D., is Clinical Professor of Psychiatry at Baylor College of Medicine and Training and Supervising Analyst at the Center for Psychoanalytic Studies in Houston, Texas.